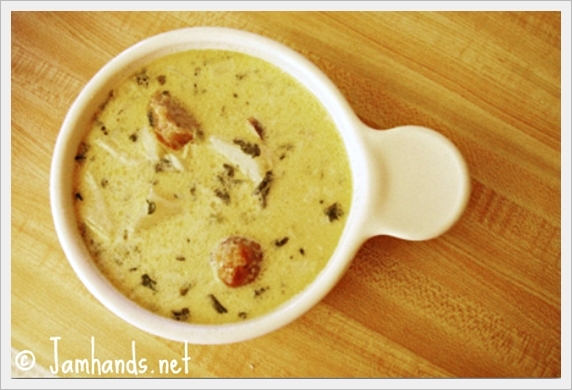 The Zuppa Toscana soup from the Olive Garden is a dish loved by many. I don't get out to eat very often so I decided to try making it at home. I made this in the morning and served it for dinner. I think giving it some time in the fridge lets the flavors develop well. I used regular Italian sausage. Spicy or sweet Italian sausage would also be delicious. Cook sausage in a 300°F oven for approximately 30 minutes. Alternatively, cook in a skillet. Drain sausages on paper towels and cut into slices. Place onions, potatoes, chicken broth, water, garlic in pot, and cook on medium heat until potatoes are done. Add sausage. Salt and pepper to taste. Simmer for another 10 minutes. When potatoes are tender, mash some of the slices with a fork to thicken soup slightly. Turn to low heat. Add spinach and cream. Heat through. Sprinkle with bacon and serve. *You can use up leftover baked potatoes by peeling potatoes cold, cutting them into slices and adding at the end of the recipe and heating through. Set aside one cold potato and mash with a fork to add to the soup when specified in the recipe. I made some minor changes to the original recipe, which can be found here. It's actually mu favorite thing at Olive garden! That and the salad, extra olives. you've been hacking into my email again haven't you? My sister just emailed me this recipe yesterday and told me she made it and it was wonderful. I've never had it. I'm not a fan of italian sausage though but she directed me where to buy some that isn't overrun with fennel. I made this and I did not like it. But that's because I don't like Italian Sausage. I think next time I make it I will cook my bacon separate from the sausage. And I will use smoked sausage or polish sausage instead. Otherwise it was good. I found your new site! Love it! I love Zuppa Toscana Soup but so you know the olive garden doesn't use spinach, they use kale. Also don't forget a little red pepper flakes for the hint of heat that is key.